Yes, that’s me in the photo, albeit about 55 years ago. My sister took the shot one day when I was feeling exuberant. Maybe my team won a game, maybe I got good grades, maybe I just felt good. I don’t remember. Today I feel like standing on my hands but I wouldn’t dare do it. The reason for my joy? I weighed myself this morning and i have hit another 5 lb milestone in my slow steady progression to lose 60 or more lbs using the Weight Watchers Plan. I have now lost 20 lbs. Hooray for me. 2. Eat a balanced diet with at least 5 fruits and vegetables per day so as to maintain your health. I don’t like many vegetables, so I load up on fruits. Mostly they work as a snack or in a smoothie. Take a daily multi vitamin. 3. Slow and steady wins the day. Reasearch shows and I agree, quick gimmicky diets don’t work. Yes, you lose weight at first, but you gain it right back. The key is to change your life style. Now I know many health and wellness experts suggest you need lots of exercise to lose weight, but my exercise consists of 30-40 minutes of housework per day and a turn in my garden of 10-40 minutes. Sometimes I walk, but only when the weather is nice. I don’t do hot and muggy. The biggest challenge is the mind-set change. When I finally got it through my head that I would have to do this one day at a time for the rest of my life, things changed for me. I had to face the fact that to stay thin, I will be on a healthy diet the rest of your life. This is easier for me than some because there are so many foods that tempt others that I don’t eat. Once in a while we will get something from a fast food place, but that happens less than twice a month most months. We do go out for breakfast occasionally, but I stick to bacon and eggs, not other stuff. And I like fried mushrooms, so I always get those with my eggs. We don’t eat meals in restaurants at other times of the day. Unless of course it is breakfast. When it comes to losing weight, getting your finances under control or getting sober, the old Aesop fable about the tortoise and the hare is so true. Now some folks try to make this a turtle and rabbit race, but that is wrong. Turtles are water creatures whereas tortoises are land creatures. And hares and rabbits are different creatures. So a race between a hare and a tortoise would be very different from a race between a rabbit and a turtle. Now, if we could only get our leaders to accept this old bit of wisdom. But, as my Mom once said, “Rome wasn’t built in a day.” The first step is to get them to accept they need to go on a budgetary diet. Two weeks later working 10 hours per day, I have finished scanning all the negatives stored in my acid proof photo box. You might recall I did the slides before I did the negatives. Now all I have to scan are reams of photos. Many are loose in my photo box, many in the dozen or so photo albums I own. I am taking a break from scanning to sort the scanned items to disks and drives. Meanwhile, below is a photo I love. Do you recognize it? 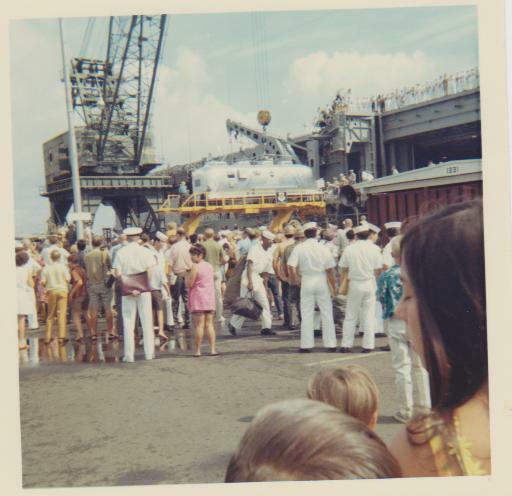 That’s the Apollo 11 crew being hoisted from the deck of the USS Hornet after their recovery at sea. I took it from the Bravo pier in Honolulu in 1969. This entry was posted in Cooking and Food, Economics/Home economics, Elder Blogger, Film and Television, Health/Medical Stuff, Memories, Technology and Science by SchmidleysScribblins. Bookmark the permalink. Lots of good thoughts in this post about right personal living. Also, the idea that our politicos should face up to reality and move carefully forward to solve real problems is a winner. I mentioned your name in my blog today. You are an inspiration! Bravo on weight loss and lifestyle change. i too have had to change. My “David-style” metabolism began to change in my 40s. By my 50s i could no longer indulge in uncontrolled holiday eating Thanksgiving to New Year’s and eliminate the extra pounds by the end of January then by the end of February, then not at all. The lifestyle change and keeping within a 5 pound range came when i started doing the diabetic exchanges. When I stop being strict with that plan and with the low sodium mandate from my doc, my weight creeps back up. I am at the top of that range now, and am returning to “sanity,” slowly. There are consequences for individuals with poor eating habits and for nations whose citizens allow, empower and even demand poor spending habits from their government leaders. I wonder what Weight Watcher points would be for spending decisions by government elected and appointed officials? One thing that drove me to change my lifestyle was the threat of diabetes. I may develope it anyway some day, but why run the extra risk of having to adhere to a diabetic eating plan and gain even more weight? As for government officials, yes they need to reduce or eliminate their propensity for buying votes by doing things for individuals they should do for themselves. You are so right about crash dieting being a waste of time. Steadily reducing your calorie intake and changing your life style is the only way. Sadly, I fell off the wagon a year ago and have put on an extra 10 pounds. I’ll have to get it off again, I feel less mobile with the additional poundage. I have to do a lot of uphill and downhill walking – it’s inevitable round here – and I’ve started to wheeze with the effort! Re your last comment: of course you are right, there are times when a nation just has to intervene. For myself I prefer to leave politics, religion and money out of my blogging life (and my social life except with very good friends) as far as I can; it’s so easy to offend or get hold of the wrong end of the stick. The other thing is that our community is spread all over the globe and we can never know all the ins and outs of another country’s domestic problems. I promise not to react in future. Friko, you are so wise. Yes, the extra poundage puts a strain on our bodies. I feel so much better having lost the 20 lbs. I don’t know where I had it hidden because I look about the same. As for politics, right again. I wish the world was devoid of bullies but it isn’t. I don’t envy anyone (Bush or Obama) who has had to make the tough decisions. Congratulations on the weight loss. I like the fact that you are making a “life change”…I’m convinced that it’s the only way that it works. I’m surprised it took me so long to figure that truth out. Duh. Oh, I am so looking forward to seeing you three weeks from now. 🙂 Not social either. At least you go out to meet friends at restaurants, we have been very insular as a pair. This time I actually worried about dinner for 4…oh, you would have laughed at me. I did. It was a very successful example of socialization of us two alcoholics. Not looking forward to the food diary again. I understand your love of chocolate but I can only eat the really good stuff, and as its expensive, I seldom have it. We don’t meet friends in restaurants that often any more. David had three years of sobriety in that photo and was crazy as sh**. Oh to be able to stand on my hands, I never could. I never went on a diet either. For me the secret is to get up from the table knowing you could eat a little bit more. Breakfast, in my book, is the most important meal of the day and with a good breakfast and evening meal, a light snack is all that is needed mid day. Cut out all nibbling in between meals. If you have to nibble, then make it a banana. Mid afternoon I will eat an apple as it is more refreshing than an cup of tea or coffee. Some of us are blessed with the genes for fatness. David is not. He eats what he likes and does not gain. Are you sure it was 1968? I recall seeing the moon landing in a bank in Thailand in 1969. I was an English teacher for 10 months there. Anyway, cool picture! I am beginning to agree with you about slow and healthy dieting. Slim-Fast is horrible. I often feel weak and hungry during the day and find myself cheating. I think I’ll go online and learn more about Weight Watchers, since you and blogger Linda Reader have had good results with that type of diet. Yes, you are right. I rely on my friends to keep my dates correct. We were in Hawaii for several years 1967-69, and all I could remember was that 1968 was one of them. Try the WW diet. You can eat anything you want just count the points. Sounds unbelieveable but it works if you work it.